M T D N o v e m b e r 2 0 1 8 66 T i r e S a l e s a n d S e r v i c e Representatives from Continental Tire the Americas LLC and Hunter Engineering Co. were on hand as well as customers from local body shops. Ryan Evans, an expert vehicle painter from the popular TV show "Counting Cars," did NitroHeat painting demonstrations and took photos with customers. A COMMITMENT TO HIGH-QUALITY e Sarkis Motors brand was built in two ways: by delivering decades of exceptional service and by employees treating their customers' cars like they treat their own. 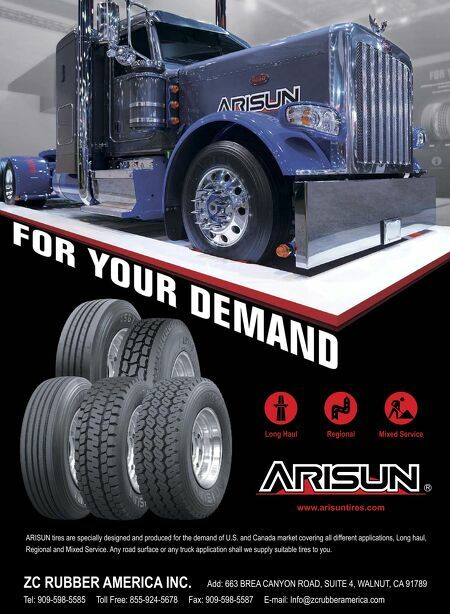 Ohanian plans to continue that philosophy with the expansion into tire sales and service. "We want to deliver high-quality service to people who want to maintain their cars properly, and we do that by using original parts, high-quality paint, high-quality equipment," Ohanian says. "at's what we do, we don't know any other way. "From a business standpoint, it eats into your bottom line. 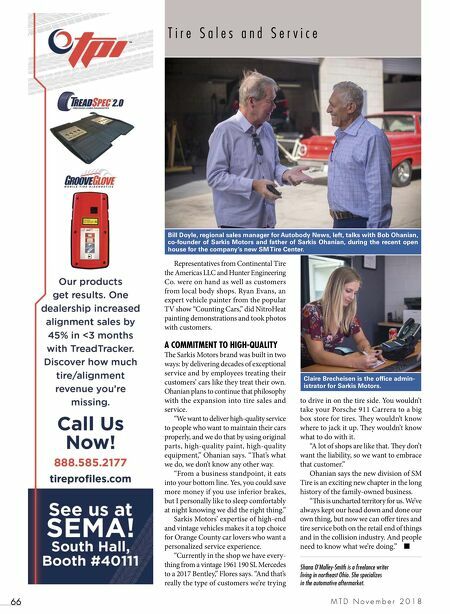 Yes, you could save more money if you use inferior brakes, but I personally like to sleep comfortably at night knowing we did the right thing." Sarkis Motors' expertise of high-end and vintage vehicles makes it a top choice for Orange County car lovers who want a personalized service experience. "Currently in the shop we have every- thing from a vintage 1961 190 SL Mercedes to a 2017 Bentley," Flores says. "And that's really the type of customers we're trying to drive in on the tire side. You wouldn't take your Porsche 911 Carrera to a big box store for tires. ey wouldn't know where to jack it up. ey wouldn't know what to do with it. "A lot of shops are like that. ey don't want the liability, so we want to embrace that customer." Ohanian says the new division of SM Tire is an exciting new chapter in the long history of the family-owned business. "is is uncharted territory for us. We've always kept our head down and done our own thing, but now we can offer tires and tire service both on the retail end of things and in the collision industry. And people need to know what we're doing." ■ Shana O'Malley-Smith is a freelance writer living in northeast Ohio. She specializes in the automotive aftermarket. Bill Doyle, regional sales manager for Autobody News, left, talks with Bob Ohanian, co-founder of Sarkis Motors and father of Sarkis Ohanian, during the recent open house for the company's new SM Tire Center. Claire Brecheisen is the office admin- istrator for Sarkis Motors.